If you are considering a move to Gettysburg, then you probably know that it is the site of the 3-day battle that marked the turning point of the American Civil War, the nation’s first military battlefield, and Lincoln’s famous Gettysburg Address. What you might not know is that this charming small town in rural Adams County, PA, offers more than just historical monuments, landmarks and archives. It is also home to two area colleges, a music conservatory, theaters, museums, art galleries, wineries and many locally-owned shops and restaurants. This treasured town offers something for everyone from history lovers to artists, families to retirees, and students to teachers. Tourism is the heartbeat of Gettysburg. Newcomers to Gettysburg should be prepared for the busy tourist season from June to September, and an extended season of festivals, concerts and other special events during the fall and spring. Peak-season traffic can be a hassle but locals know the side streets and rural roads to avoid the crush. The heaviest visitor influx occurs Fourth of July week--the annual commemoration of the Battle of Gettysburg (July 1-3,), and the following week--Gettysburg Bike Week (July 12-15)--which draws motorcycle enthusiasts from near and far to enjoy scenic rides and everything “Harley” at the nearby Harley Davidson Center. While not a hub of industry, healthcare, education, and service industries thrive. While many low-wage jobs exist in tourism, hospitality, and service industries, higher-paying jobs can be found in healthcare and education. With its close proximity to larger towns and cities like Hanover, York, and Harrisburg as well as Baltimore and Washington, D.C., many professionals find Gettysburg’s family-friendly, laid-back lifestyle and affordable home prices (median: $235,000) well worth the commute. The Gettysburg Adams Chamber of Commerce offers a valuable breakdown of the cost of living in and around the Gettysburg area. Healthcare: Although it’s a rural community, Gettysburg has a complete system of health-care services. It has one of the two hospitals located within Adams County (the other is Hanover Hospital) within its borough, and WellSpan, the hospital’s parent company, offers integrated health services throughout the area and health-care centers offer medical and rehabilitation services. Insuring your new life in a historical town. 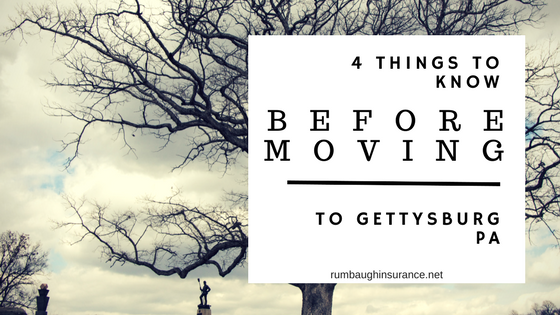 Whether you’re a history buff, an active family or retiree with time to explore, if you’re considering a move to Gettysburg, PA, remember to request quotes for home and car insurance from an independent insurance agency. Independent agents have access to many different carriers and will work with you to find the best coverage.